Each year since 1954, science fiction fandom has been awarding the Hugo to the best and brightest in speculative fiction. This year, the nominees are the usual gathering of fantastic words and pictures, but a couple of names stand out on the list. 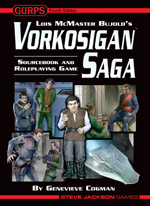 In the Best Novel category, Cryoburn by Lois McMaster Bujold jumps out -- that's the latest installment in her Miles Vorkosigan universe, the basis of our Vorkosigan Saga Sourcebook and Roleplaying Game. In the Best Graphic Story category, Girl Genius, Volume 10: Agatha Heterodyne and the Guardian Muse (by SPANC artist Phil Foglio) competes with Schlock Mercenary: Massively Parallel, written and illustrated by Munchkin and Zombie Dice fan Howard Tayler. Also in the same category is Fables: Witches, written by Bill Willingham . . . the same Bill Willingham who illustrated the cover of the classic D&D module Against the Giants (a personal favorite!) as well as numerous interiors for TSR back in the day. Getting on the nominee list is an indication of amazing quality by itself, and if you're looking for a summer reading list, you're very likely to find something you'll love here. If you'd like to get involved in the voting process, the best way is to attend Worldcon, the roaming convention that hosts the Hugo Awards. This year it's in Reno, Nevada, in late August. But if you can't attend, you can still pick up a Supporting Membership, which, for $50, gives you the right to vote on the nominees . . . and digital copies of all the nominees.